Bono says he is a Christian. But his past and present actions sure tell a different story, especially his supposed declaration of his faith in Jesus while releasing music with gays embracing on his latest CD. He is singing for the United Nations because they supposedly don’t have enough money for Ebola and AIDS, despite the fact that America pays a majority of the money given to the UN. 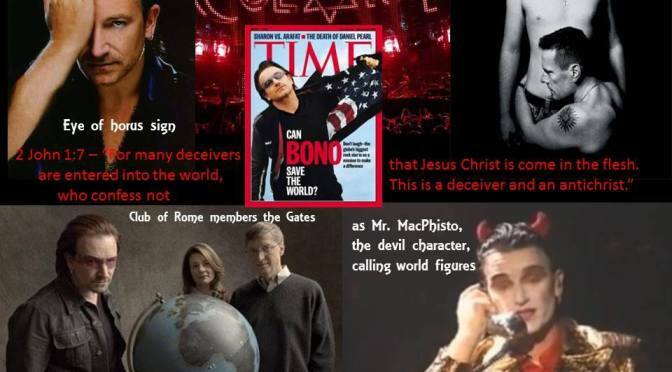 Bono is a deceiver and he is raking in all kinds of sheep through the Emergent Church movement (Rick Warren), a deception that needs to be brought out into the open. UN is the gatekeeper for the One World Religion that will come, through the deception of false pastors and celebrities such as Bono, preaching unity, world peace, and social justice, while taking care of Mother Earth: the Gaia Religion that the New Age movement will use to deceive the masses. “Bruce Springsteen and Coldplay’s Chris Martin will perform with U2 Minus 1 in a live World AIDS Day performance on Monday in New York’s Time Square, filling in for the group’s injured lead singer Bono who is recovering from a cycling accident. Bono of U2 is viewed by many as a “prophet” and icon in the Emergent Church movement. He states that his satanic stage personas were inspired by C.S. Lewis’ Screwtape Letters, but in what way and for what purpose? Watch as we reveal the truth of what inspires this Emergent rocker. Eye of Horus is known by many names: the Eye or Ra, the Eye of Osiris, the Eye of the Moon, or Wedjat. Horus and Ra are two references of the same ancient Egyptian deity, while Osiris is Horus’ father. Horus (or Ra) was regarded as the Sun god, or the Sky god, and is said in legend to be half man – half falcon. The Eye of Horus is one of ancient Egypt’s most popular symbols, and hieroglyphic inscriptions of it are found in many archeological sites across Egypt. Many tombs have been found to contain the Eye of Horus hieroglyphs. The hexagram referred to in bible as “Star of Remphan” is used in many occult and new age high ceremonies.